RoCkaNdFRoCk: YoU WiLL Be MiNe ( part 2 ). YoU WiLL Be MiNe ( part 2 ). Bella in feltro.. proprio autunnale! what a pretty bag <3 hope you can find a nice deal! OMG! I'm in love with it too, wonder how much it costs? seriously? are you checking out Celine's site again? you just bought a bag like (what?) 2 months ago!!! you're addicted, huh? 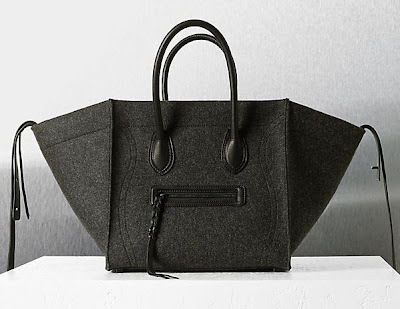 anyway, the bag in felt is gorgeous and if you like it... go for it! WOW! This is to die for!!! No!!! ti aiuterò io a infilarti in boutique! hi, lovely bag! jadore it! ahahahaha!! anche io la voglio! però la preferisco di pelle! The husband should just give you what you want! You could pick out a lot more expensive bag, right?? I hope you get it!! Your blog is AWESOME!!!! !Thanks for stopping by and for your comment!! Anche io non penso costi meno...e' una pia illusione di mio marito...baci! riuscirà la Valeria a farla franca!? sembra Beautiful eh???? Mica lo so se stavolta tornerò vincitrice, il marito si mette di traverso...baci! So cool !!! perfection ! Mi piace un sacco la tua blog! Se hai voglia possiamo seguirci su bloglovin e gfc? Gorgeous bag!! I hope the hubby says YES! LOve the colour and the texture of the bag! c'è un nuovo post sul mio blog, mi farebbe piacere sapere cosa ne pensi! LoVe iT oR HaTe iT. SToP bY aNd SaY Hi.